A gentle stroll through EP flux theory. A lot of references at the bottom. That warming mentioned earlier this month showing on charts of Tokyo Climate Centre - it's position in mid to high stratosphere is more precisely located on noaa's chart. strong Zonal Wave 1,2 & 3 activity (3 prominent) early Nov which created strong deformation in gph and wind fields of stratospheric polar vortex. (Both fields elongated and briefly pivoted from continent to centre closer to 60s). 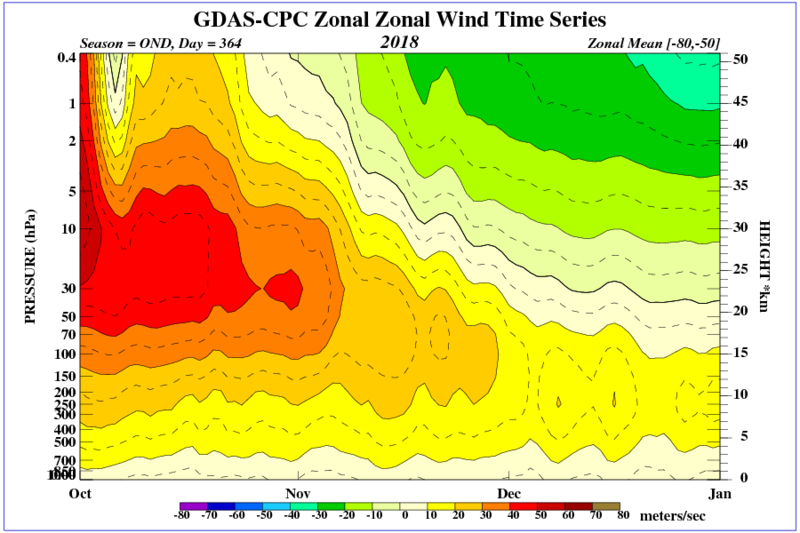 PV in 20hPa region showing strong deformation by about 7 Nov. In space of 10 days circumpolar wind speed @ 10 hPa will have roughly halved according to gfs forecasts. Might represent the first indication of the beginning of the approach of the final warming event for this year. 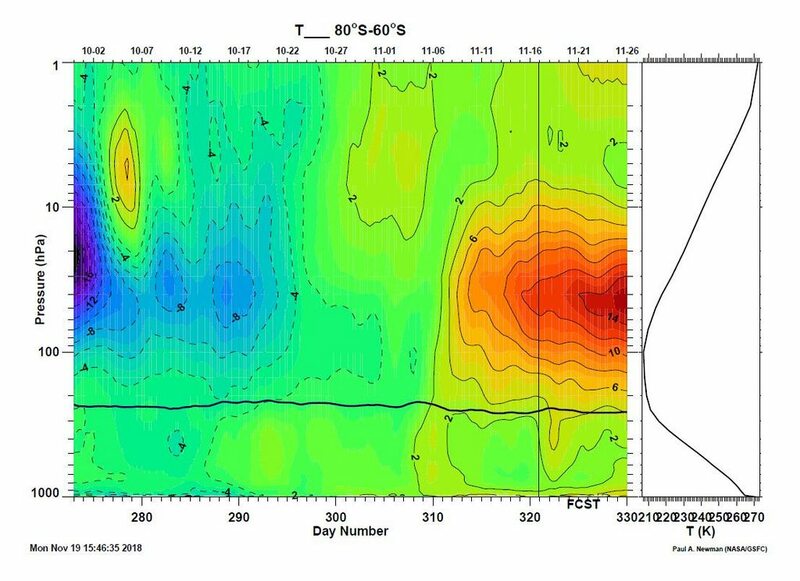 Planetary wave activity(as evidenced by EP flux) for october was anomalously negative which might help explain any delay if the sspv is later getting to breakdown this year. 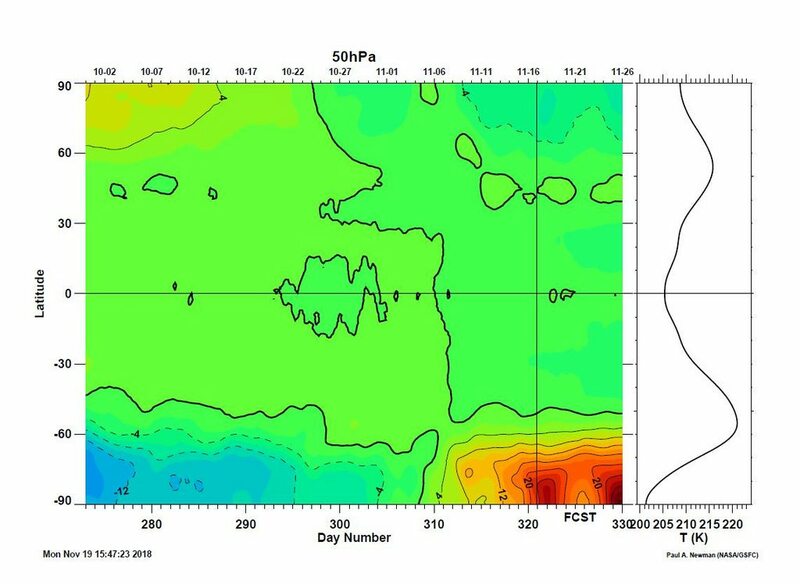 One criteria for final warming I've seen -and there are others involving different parameters so this might not be universally accepted - is for the winds @ 50hPa to drop below 1m/s - so the breakdown in the winds has to migrate downwards for the final warming to complete. 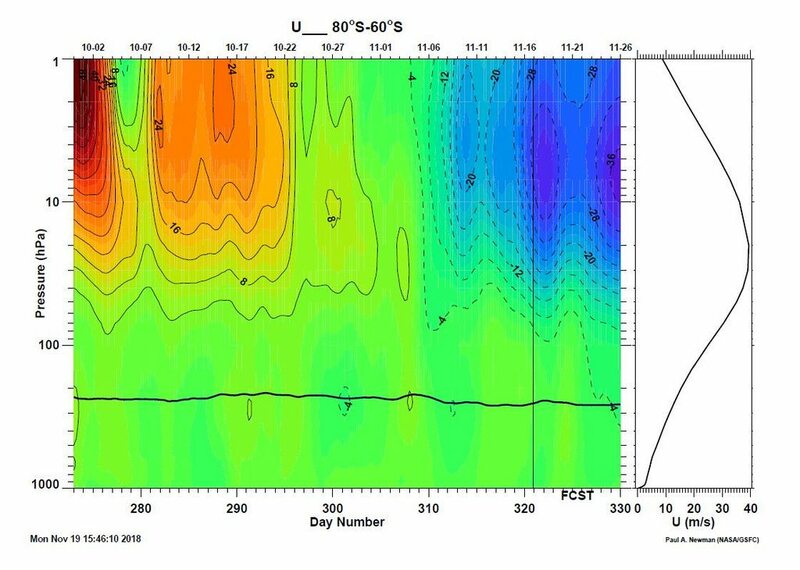 Ever wonder if Stratospheric sudden warming was an escape of heat into space? Out instead of in? in mid-latitude low atmosphere and stratosphere-ionosphere coupling. Unfortunately I cant link to it from the machine I'm presently on. 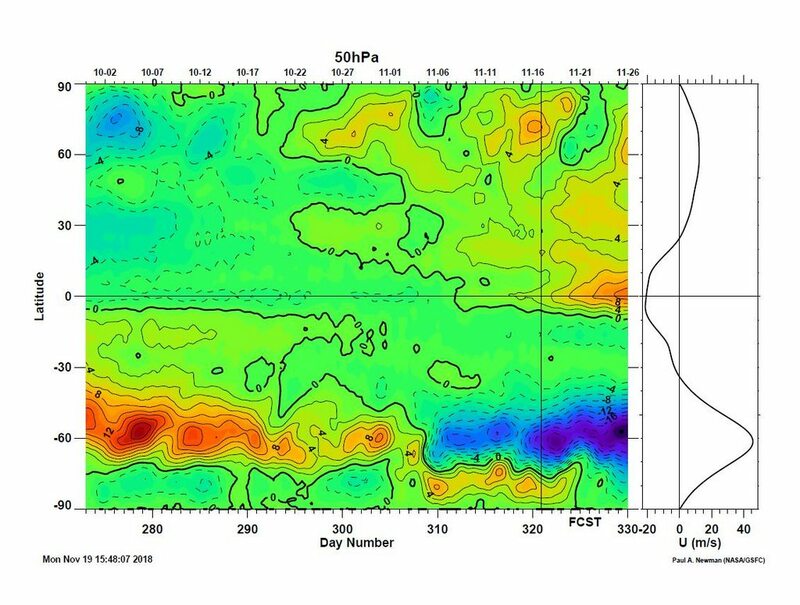 So a major SSW is underway for the Southern Hemisphere? And this might have something to do with the unusual cut off low pressure activity forecast over the next week or so, with multiple large cut off lows near Australia for much of the current forecast period? Given the time of year I'd say the current warming is the final warming before the vortex breaks up for summer? I have also noted the ozone hole is in a state of rapid decay now, which is not all that unusual at this time in Nov, however what is interesting is this years hole was larger than normal which would usually mean a longer lived vortex/ozone hole. At the current rate of decay it will probably be almost closed by the end of the month. We've dropped from 20.52 million km in size on the 4th Nov to just 9.12 million km at the last update on 18th. I've only been closely watching the annual hole now for 2yrs, but that seems like a fairly rapid drop to me. Correct me if I'm wrong of course. 14k change on the first chart starting about 9/11, mightn't qualifiy as a major ssw - I think it has to occur over one week's duration and this one I think is a little longer - a pedantic point. but be quick because the start date of the animation moves forward each day. I think there was an earlier more impressive warming(on the charts) but the date of the starting window has already moved beyond it. The nasa link I posted above had mzw@50hPa fading out by about the 24/11(that was last saturday's forecast). The axis of the sspv has not been consistently tethered over the antarctic continent in response to recent warming and currently looks to have a disproportionate bias towards the eastern hemisphere. There was a big shift in the generally circular, to a more erractic ellipsoid, shape and circulation about 8/11. 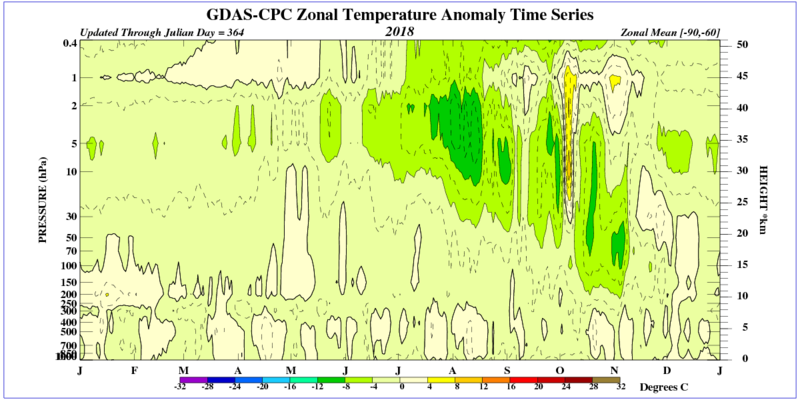 The point of intersection of the winds associated with the vortex abruptly shifting in the zonal "corridor" in phase with this distortion in circulation - it's nicely portrayed in CS22's final chart. 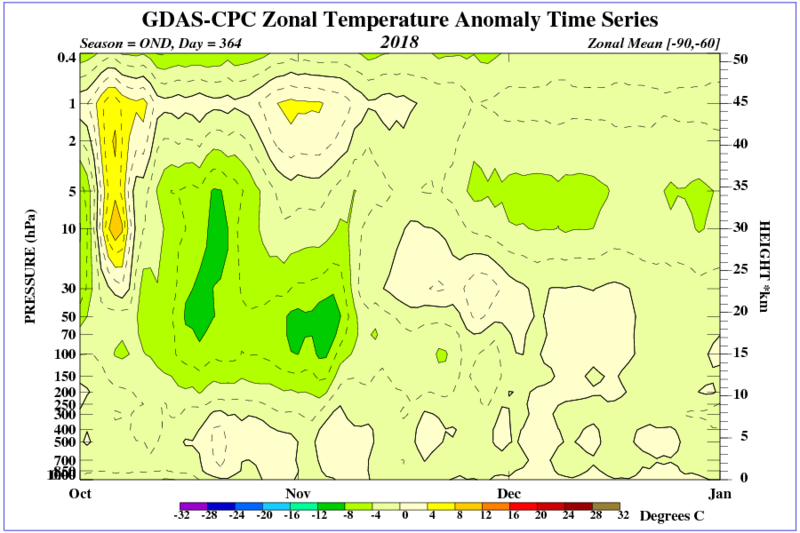 (ie: the spv boundary winds shift from > -60 to ~ -85 in short time - evidence of asymetrical spv oscillation? It is a fascinating region of the atmosphere - as much for the idiosyncratic lapse rate which is like a reversed mirror image of the troposphere. While tracing connection between the two is of huge interest, the detail of interaction is still a mystery to me. I only have cpc chart updated to 4/11. In case you haven't got them, all the completed annual charts back as far as 79-80 are available. I dont know if this year's rate of decline is more or less rapid than mean - perhaps for recent years and particularly from a hole size at the upper end of the range it is. 2011, though a much smaller hole at the time(but had been near the upper end of the range leading up to this point), plummeted from ~13m sq km's to 3m in a very short period. The rate of decline I wonder if it is correlated directly to the concentration of ozone in the collar region - I imagine it might be though I don't have any data to back that up with. The initial warming strikes high. compared to novembers, the proportionate increase in temp below 10 hPa is greater. These forecasts do jump around a bit but the few forecasts I've seen maybe the integrity of vortex in the lower stratosphere-upper troposphere is going to hold together a little longer than I thought a few days ago. This might be interesting for some here. The atmosphere and the ionosphere are tightly (two-way) coupled by plasma–neutral interactions during quiet and as well as geomagnetically disturbed conditions. In this context, “two-way”does not indicate upward–downward directions in the atmosphere; namely it means that neutrals can impact plasma processes as well as plasma can drive neutral dynamics, depending on the latitude. Hearing plenty of chatter about one next week. 5 registered (bundybear, red earth, Homer, explorer, Manly), 61 Guests and 4 Spiders online.